As I was gallivanting around Manhattan this weekend, I spotted, on two separate occasions, a Volvo S60 Cross Country. In the days since I decided this is what the future of sedans looks like. Despite one of the sightings occurring on the Lower East Side and the other happening on the Upper West Side not long thereafter, I do believe these were the same car. While this one unoccupied, street-parked Volvo miraculously being driven to the opposite end of the city faster than I could get there on the subway sounds implausible, it’s far more preposterous to assume that both of the S60 Cross Countries they sold are in New York City. I kid, but sales of the S60 Cross Country are quite tame. 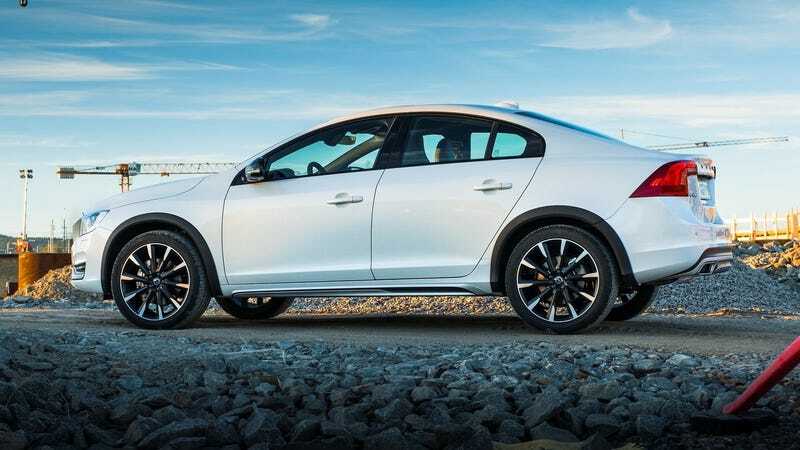 For the uninitiated, the S60 Cross Country is a Volvo S60 sedan that received an increase in ground clearance and the gray plastic body cladding we inexplicably associate with crossovers. With all-wheel drive and the updated styling, the rugged S60 Cross Country took the world by storm: in 2016, its first full year on the market, they moved 563 of them. Obviously, sales that astronomical couldn’t remain high forever. The S60 Cross Country is still available new in 2018. Know how many brave adventurers took the plunge last month, across these 50 united states? Those owners will go down in history as pioneers. Because while the S60 Cross Country is an undeniable flop—albeit one with character, and we like that sort of thing around here—that’s likely a result of it being a non-publicized version of a middling car from a company desperately trying to finish its replacement. The concept, a sedan-shaped pseudo-crossover, is something I predict will be copied by more manufacturers in years to come. Do you remember this? DO YOU??? In fact, Volvo isn’t the only company to have tried it. The Subaru Legacy Outback was offered in sedan form over a decade ago, predating the larger crossover craze. It also sold in higher numbers than the Volvo, but the Scandinavians brought the concept back at a time that the market is more friendly to the idea. Now, in addition to the obvious blending of SUV and sedan elements, I noticed something interesting about the Vision Mercedes-Maybach: it is horrendous. I bet something like it comes to market anyway. Especially in the ultra-luxury market, the ostentatiousness of having a massive SUV-size monster truck rolling around with no increased practicality and no chance of off-road performance is too juicy to pass up. It’s yet another example of intentional impracticality, where being able to operate a vehicle so ridiculous that it shouldn’t exist is justification enough for purchase. See: Mercedes G63 AMG 6x6, Mercedes G500 4×4², Mercedes-Maybach G650 Landaulet. Notice a common theme? Benz has a knack for this kind of thing. But for more pedestrian examples, look at the current crop of “coupe” SUVs. The Germans move tens of thousands of them between the X2, X4, X6, GLC Coupe and GLE Coupe. We’ve already proven that we’re willing to pay more for less practicality, whether to look different or to show off how recklessly we can spend. Crossover sedans are the natural progression of this, the darkest timeline. This is where it ends. This is where it was always meant to end, like a fate we cannot accept. I’m deeply troubled by this, because I don’t like sedans or crossovers, let alone some the most unfortunate combination of the two possible. But this is what’s going to happen. Some company will try again. Maybe a new Maybach or an Audi Allroad sedan, who really knows. Whichever automaker makes it will probably be a luxury marque, selling it purely so you can buy the bigger car than your neighbor and be known throughout the land as richer and more well-endowed than him. I can’t stop it. Neither can you. And someday, when your neighbor shows up with a Mercedes-Benz GLA180 AMG Sport you’ll know that this saga all started with the Volvo S60 Cross Country. Damn it all to hell.